The folks at QED International have informed Shock Till You Drop that the company intends to produce, finance and handle international sales for a new supernatural thriller entitled Haunt. 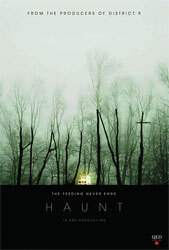 Written by Andrew Barrer and directed by Mac Carter, Haunt is the story of a family that moves into a new home with a dark past. When their son becomes involved with a beautiful girl next door, and together they begin to explore their sexual awakening, they unwittingly invoke an alternative dimension of the house. The film is is being produced by Sasha Shapiro, Anton Lessine, Bill Block, Paul Hanson, Steven Schneider and Will Rowbotham, and will begin production in November. Barrer is co-writer with Gabriel Ferrari, of Sabrina the Teenage Witch for Sony and Die in a Gunfight, which made the 2010 Blacklist and is being produced by MRC. Mac Carter previously directed the 2010 documentary Secret Origin: The Story of DC Comics.